"For all the nations have drunk of the wine of the wrath of her fornication, the kings of the earth have committed fornication with her, and the merchants of the earth have become rich through the abundance of her luxury." The other night, we announced our pleasure at Joe Straus' departure. Turns out we misread the Texas Constitution. Straus remains the sitting speaker until Tuesday. The op-ed is vintage Straus. Apparently, he's planning to create some sort of "policy shop" with his leftover campaign funds. Straus leaves a target-rich environment, but we'll focus on three claims. We've balanced budgets, cut billions of dollars in taxes and kept record amounts of money in reserves. 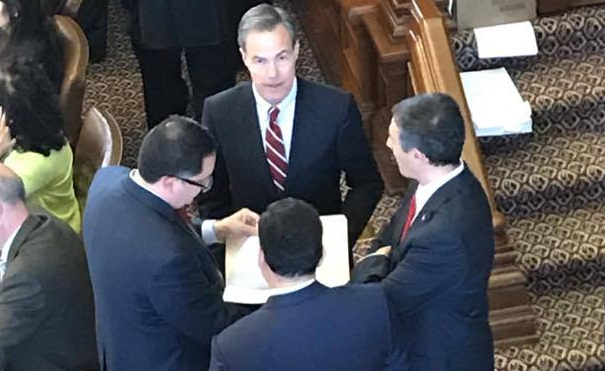 Under Joe Straus' 'leadership', the Texas house never met a spending bill it didn't like. This is the gang that, less than two years ago, wanted to drain the rainy day fund...a month before Hurricane Harvey. But, "record reserves!" There's a lot that can be said about this. "Water policy" has been an ongoing act of larceny in this state for a long time. Straus didn't invent this racket, but he absolutely expanded it. Read what we said about Straus' crowning achievement on "water policy" at the time. It's beyond the scope of this blog post, but somebody really OUGHT to examine whether Straus will be personally enriched by this so-called "policy shop." Straus yammering about so-called 'economic development' dovetails with what we said yesterday about crony capitalism.